Seattle pop culture icons are everywhere in Seattle. So which Seattle pop culture icon is your favorite? Answering that question about Seattle pop culture is one our family would definitely have trouble with. Seattle is known one of the most cultural diverse cities in the United States and once you visit, it's easy to see why so many of our country's pop culture icons have at least some connection to the city. On one end of the spectrum, a rock icon like Jimi Hendrix has his own tribute in the city. 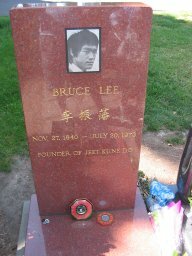 At the other end you have the final resting place of the world's most well-known martial artists, the Bruce Lee grave, lies in a cemetery just outside Capital Hill, one of the most-visited graves in the Northwest. In addition to famous people, Seattle pop culture extends to places in and around the city. Capital Hill, for example, is a very hip part of Seattle where you can see that statue of Jimi Hendrix. And don't forget the very popular Seattle Underground Tour at Pioneer Square. Fremont, a great little city where the Solstice parade is held every year, has it's own feel that you can't ever get enough of (not to mention some great Thai restaurants). 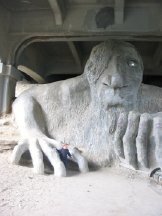 Fremont is the home of one of the coolest statues you've ever seen under a freeway overpass, namely the Fremont bridge troll, as well as a huge statue of Lenin. Oh, yeah, and while you're in the area, you might as well go and see the 5-ton Fremont dinosaur exhibit. Oh, yeah, and you can't forget the rocket at the Center of the Universe. There's just so much cultural relics around the area that you have to include a stop to at least a few of them while you're there. While your kids might not know who Jimi Hendrix was or recognize the influence Bruce Lee had on American pop culture, it will give them some appreciation for an aspect of Seattle culture that is sometimes forgotten. Plus, for my kids, it gives them at least some insight into why their parents are so weird sometimes. Return from back to Seattle Tourist. Who's your favorite Seattle pop culture icon?